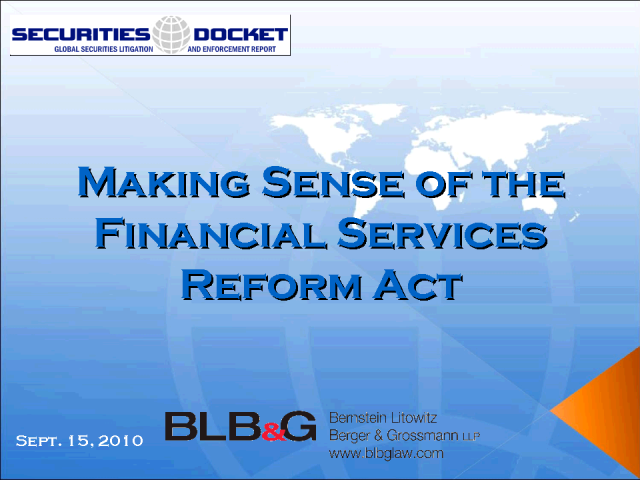 This webcast will address the likely impacts of the Dodd-Frank Wall Street Reform and Consumer Protection Act on corporate governance practices, financial reporting and accounting, among other topics. Our panel includes Salvatore Graziano, a partner at Bernstein Litowitz Berger & Grossmann LLP, and Peter J. Henning, Professor of Law at Wayne State University Law School and columnist for The New York Times‘ Dealbook (“White Collar Watch”), where he follows issues involving securities law and white-collar crime. Please join us as we discuss the Act’s significant impact on public companies and what that means for institutional portfolios.